Hope you all had an awesome Christmas. With the New Year approaching, we wanted to highlight the athletes that give us exciting content, and style inspiration–the guys with ‘impeccable taste’ off-the-court. We’ve seen loads of cool style from our favorite athletes this year–chic denim, wool wide-brim hats, sharp suits and even saw athletes wear cropped trousers, and denim overalls. We’ve had lots of risk takers this year. There are a few returning names topping the list, and also a slew of underrated guys who are trying to make their case for ‘most stylish’. One thing for sure, 2015 will be even better. 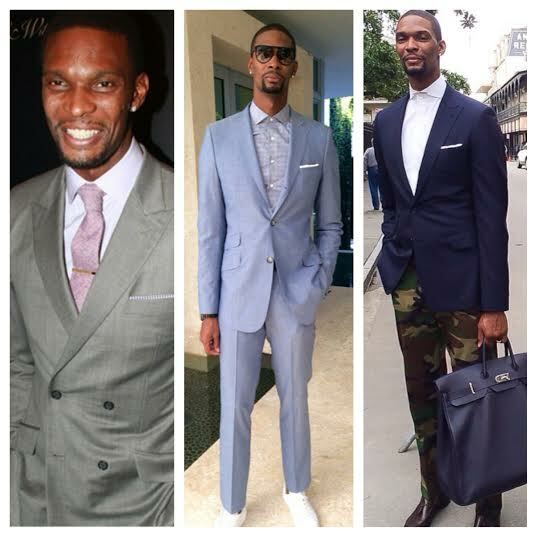 We present to you, The Best Dressed Athletes of 2014. 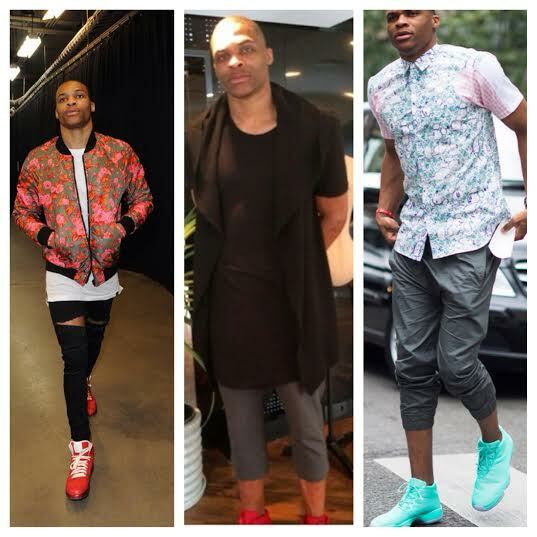 1) You never know what to expect from Russell Westbrook, which makes his style so entertaining. His outfits are constantly the center of attention, making him a media darling. Russell’s eccentric style and authentic passion for fashion has the industry [fashion] embracing him with open arms. This year, Russell’s sat front-row during New York Fashion Week with notable names such as Vogue editor Anna Wintour, and visited a slew of designers in Paris during their fashion week festivities. Russell also got involved in the business side of fashion, debuting his very own eyewear line dubbed ‘Westbrook Frames’ and collaborated with Barneys New York on a capsule collection dubbed ‘Westbrook XO Barneys New York’. What a year! 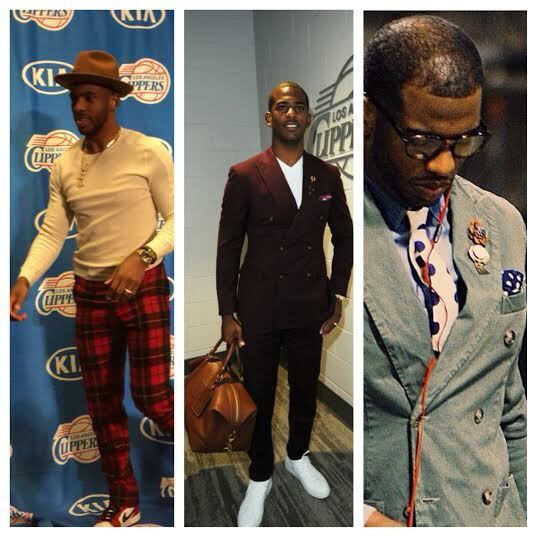 2) State Farm’s finest, Cliff Paul…excuse me, Chris Paul is a perennial man of style. His ensembles are always well-assembled, and detailed. He does an excellent job of implementing trends, youth and creativity into his outfits, which makes his style so enjoyable. 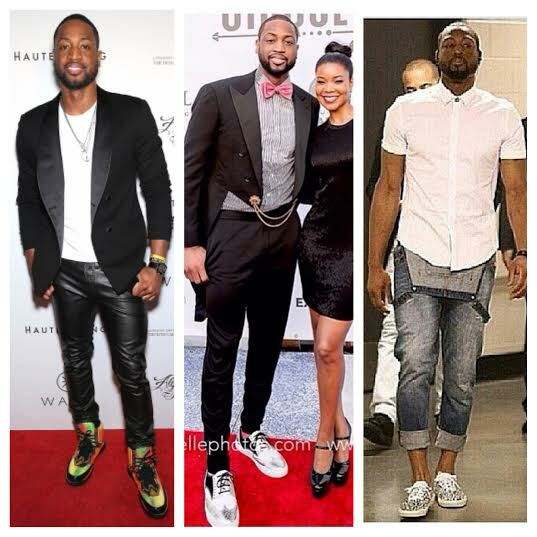 3) Dwyane Wade definitely keeps his place in our top 5. He’s been really focused this year, building his brand in the fashion industry. He has a few collaborations under his belt with Stance (socks), The Tie Bar, and his signature ‘Brand Wade’ sneaker line in partnership with Li Ning. 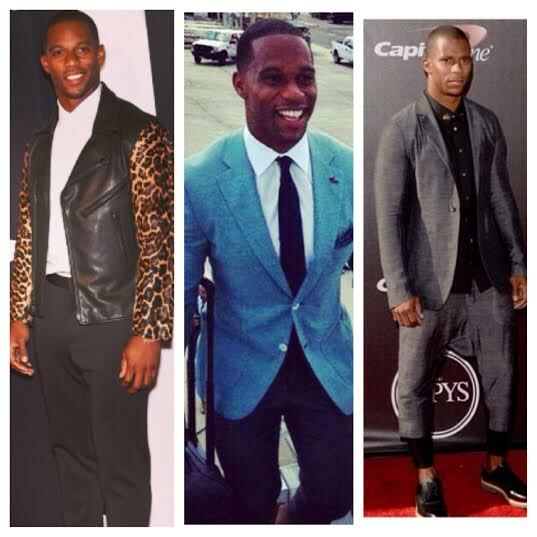 4) Victor Cruz is one of the front-runners when we’re talking about stylish athletes. The past few years, he’s shown an genuine love for fashion, attending numerous runway shows for New York Fashion Week, and even doing a bit of modeling this year for Gap Outlets holiday campaign, and clothing line Kith’s Ones Stoke lookbook. 5) David Beckham is considered to be a ‘trendsetter’ in the fashion game. The retired soccer star is keeping his hands busy in the fashion world; with his current underwear collection for H&M. David’s laid out the blueprint in style for the younger generation of athletes to follow. 6) Chris ‘Posh’ Bosh continues to give us 101 classes in sartorial elegance, his wardrobe is packed with essential for the true gentleman. Chris ended his 2014 nicely–he received a huge contract-extension with the Miami Heat, and launched his very own menswear accessory line dubbed ‘Mr. Nice Tie’. 7) When you think of stylish hockey players, Henrik Lundqvist has to be the first (maybe only) person who comes to mind. The New York Rangers goalie is never underdressed off the ice. He’s always clothed in lavish designer suits, and is adored by the fashion industries elite. Henrik also collaborated with Swedish body wear brand Bread & Boxers on a line of shirts and undies. 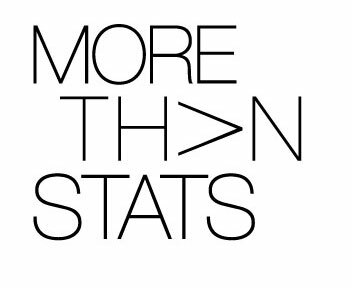 Look out for more apparel collabs for Henrik in 2015. 8) Lebron James made major moves this summer, when he elected to rejoin his hometown Cleveland Cavaliers. 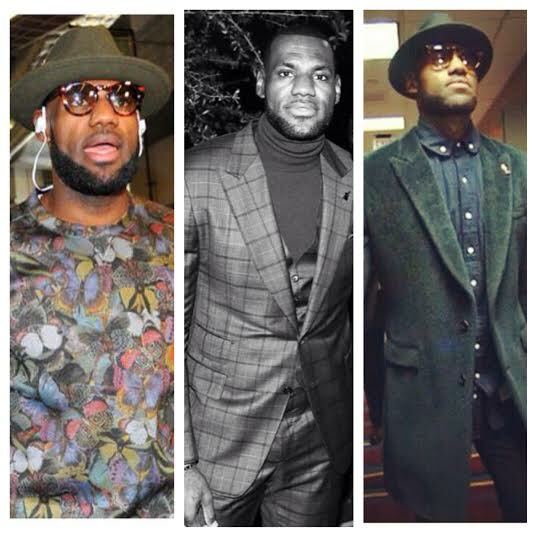 Bron successfully revamped his style as well, darken his hues and adding more outerwear pieces to his repertoire. We know deep-down Bron misses wearing his vibrant apparel in the beautiful Miami climate. 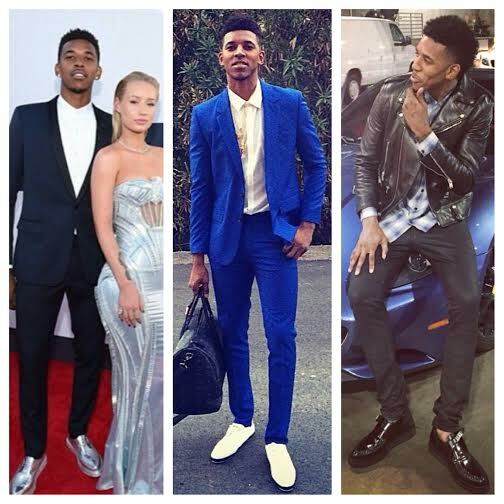 9) Nick Young had a terrific year, he started dating pop star Iggy Azalea, and has everyone calling him ‘Swaggy P’. The Saint Laurent loving basketball star’s Instagram account constantly documents his love for high-end designers, Iggy Azalea, and rare kicks. 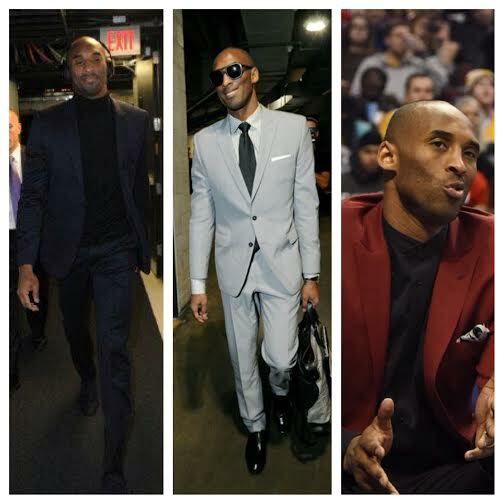 10) Kobe Bryant dresses his age, the 36-year old basketball superstar has the ‘grown man look’ down to a tee. Its all classy dress shoes, and well-tailored suits for Kobe off-the-court. 11) Carmelo Anthony displayed his affection for wool fedora hats this year. Melo picked-up on the trend, and has sported the fashionable hat in various hues and brim sizes with most of his outfits. 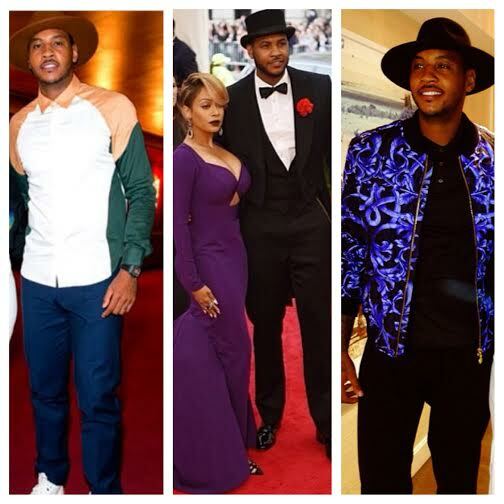 Melo showed us how versatile the fedora really is. You can dress-it-up with a sharp suit for a special occasion, or don it casually with a smooth leather jacket, t-shirt and jeans. We’ve seen more NBA players wearing wool fedoras recently as well. Not saying Melo started it, but he’s been the most consistent. 12) 2014 was a memorable year for NBA superstar Kevin Durant, who won his first league MVP award, and popularized his acceptance speech in the process. Does “You the real MVP” ring a bell? Kevin has transformed into a snazzy dresser as well, this year he perfected his suit game, and also displayed his love for high-end designer pieces. 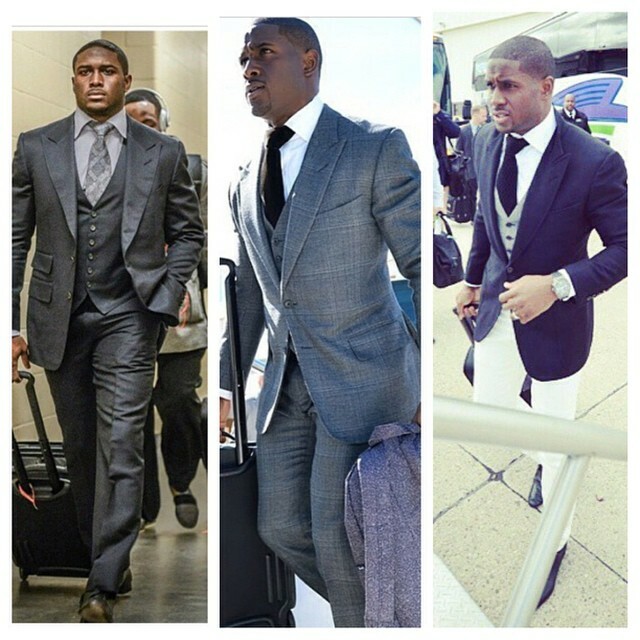 13) Reggie Bush’s selection of suits this year has been nothing short of perfection. His powerful set consist of neutral three piece suits, and has ‘smooth’ written all over it. The star running back, looks more like a notable business man when he arrives for game days. 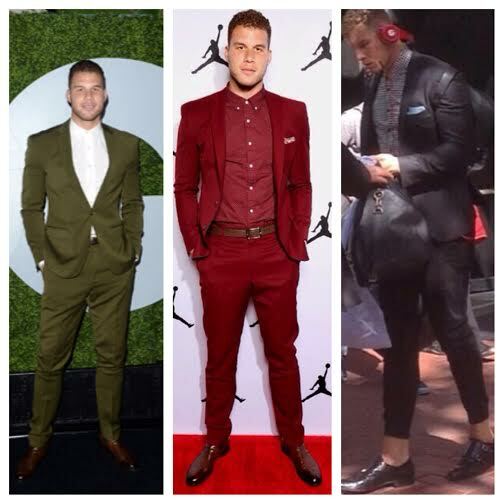 14) The NBA’s most explosive talent, Blake Griffin is a really good dresser. 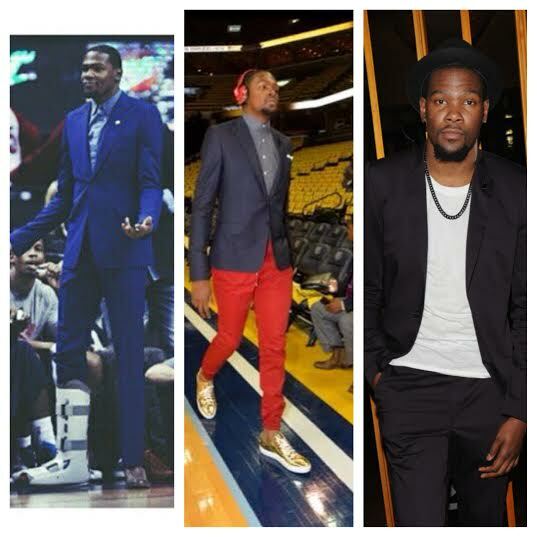 His showboat mentality transcends from the court to his sense of fashion. Blake’s personal style continues to develop–this year he’s fiddled with various hues and bold prints. Blake’s fresh approach to fashion also landed him a GQ Magazine cover this year. 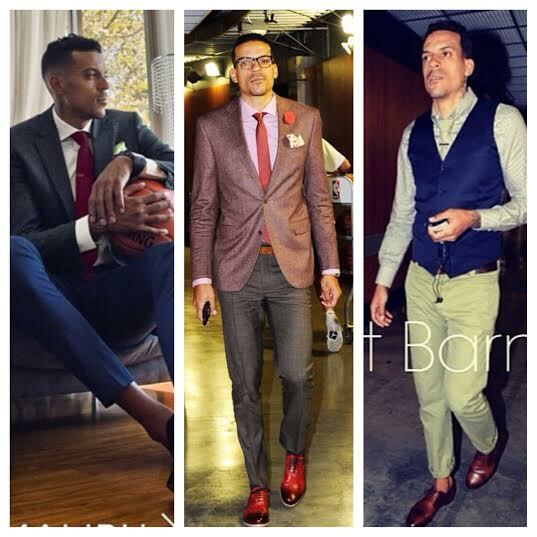 15) Matt Barnes is noted for his defensive presence on the ball court, off-the-court he’s ‘Mr. Suave’. Matt’s done a superb job with his wardrobe this year, his steady uniform consist of blended flamboyant hues and formal pieces. 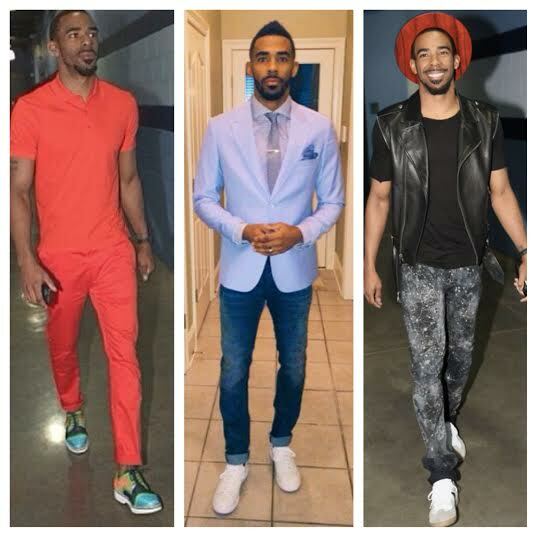 16) Stop sleeping on Mike Conley Jr! he’s super-underrated on the ball court, and when it comes to style. This is the same guy who made a fashion statement during the 2014 NBA Playoffs, when he sported a fedora-style hat with a unique wooden brim. Mike has an eclectic closet overflowing with high-end heat. He’s superlative at utilizing his entire wardrobe. For game day he’ll usually mix in formal pieces, with causal bottoms, and hi-top sneakers. 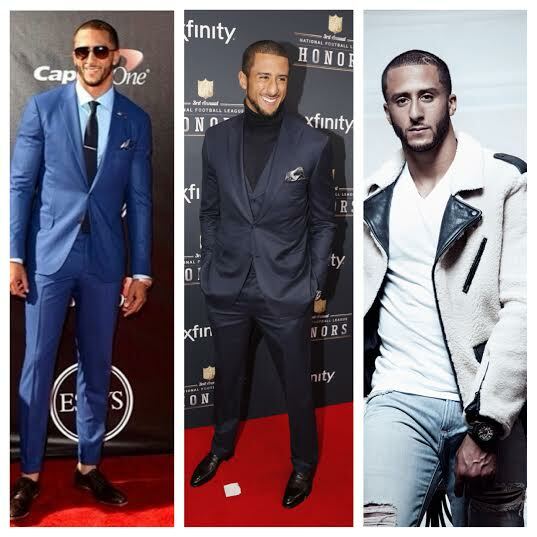 17) Colin Kaepernick‘s style has certainly progressed this year. He recently locked-down a big contract-extension with the 49ers– guessing he decided to look the part too. Kaep made a full transformation swapping his snapback hats and hoodies for form-fitted suits, and polished dress shoes. 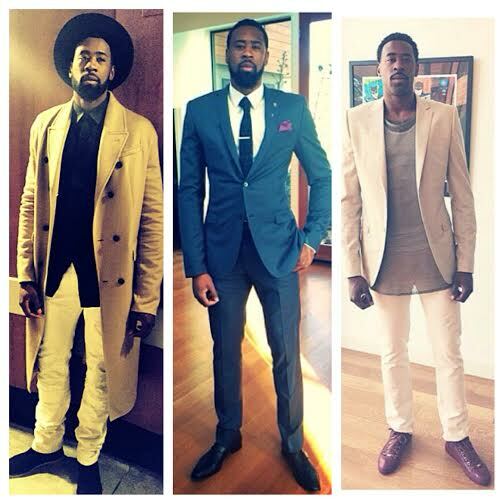 18) Deandre Jordan makes dressing his 6’11 frame look effortless. The amount of thread it takes to design his ensembles are well worth it. Amongst centers in the league, Deandre might be the most dashing. 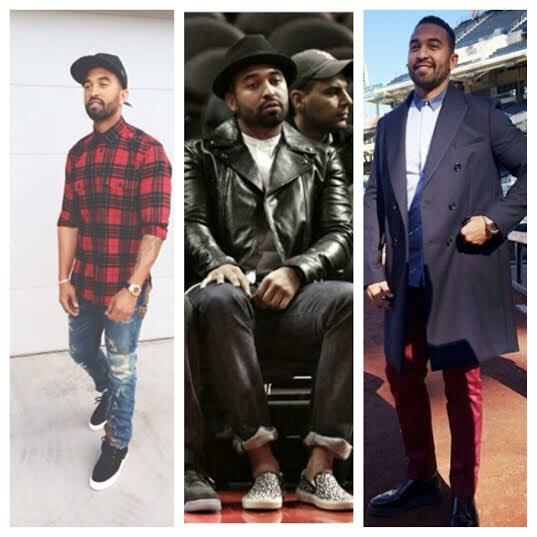 19) Matt Kemp came way out of left field, his style has definitely evolved this year. The newest addition to the San Diego Padres gives the game of baseball that much needed flair it’s been craving for.